Certain herbs may be helpful in treating your sarcoidosis, which is an autoimmune disease that causes inflammation throughout the body. Although sarcoidosis can affect any organ in your body, it usually targets the lungs, skin and lymph nodes. Before taking herbs to help treat your sarcoidosis, talk with your doctor about possible side effects, proper dosage and potential drug interactions. Turmeric, also known as Curcuma longa, is an herb that may be helpful in treating your sarcoidosis. According to the University of Maryland Medical Center, turmeric, a member of the ginger family, has been used for hundreds of years in both Ayurvedic medicine and traditional Chinese medicine as an anti-inflammatory to help treat numerous health problems. Turmeric is a perennial plant that grows in the tropical regions of South Asia, especially in India. Turmeric has a bitter, pungent taste and cooling and stimulating tendencies. It grows to a maximum height of about 6 feet. The rhizome, or underground stem of the plant, is used medicinally. Ed Smith, an herbalist and author of the book "Therapeutic Herb Manual," states that turmeric is a potent antioxidant and anti-inflammatory that is helpful in treating various inflammatory disorders. If you have sarcoidosis or certain inflammatory skin disorders, you may benefit from taking this herb. However, you should only take turmeric supplements after talking to your doctor. Dr. Sharol Tilgner, a naturopathic physician and author of the book "Herbal Medicine From the Heart of the Earth," states that chamomile, also known as Matricaria recutita, is an anti-inflammatory, analgesic and antipyretic whose anti-inflammatory action can be partially attributed to its ability to inhibit arachidonic acid metabolism. Excessive amounts of arachidonic acid may increase your levels of inflammation, exacerbating sarcoidosis-related symptoms. Tilgner notes that chamomile, a member of the aster family, contains several anti-inflammatory constituents, including alpha bisabolol and chamazulene. Chamomile is a flowering plant native to Europe, north Africa and certain parts of Asia. Chamomile has a sweet and slightly bitter taste. 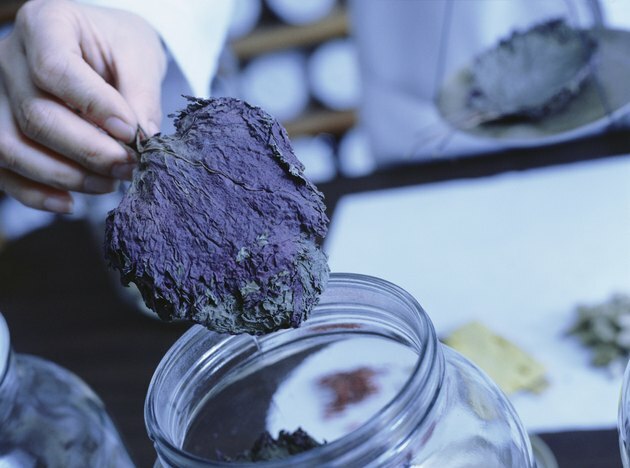 The fresh or dried flowers of the plant are used by practitioners of botanical medicine to help treat many health problems, including sarcoidosis and other inflammatory conditions. Goldenseal is a small pant with jagged leaves, tiny flowers and raspberry-like fruit. Goldenseal thrives in rich soil and shady conditions in the northern United States and southeastern Ontario, although due to over-harvesting, most goldenseal is now grown on farms throughout the United States, especially in the Blue Ridge mountains of North Carolina. Goldenseal, also known as Hydrastis canadensis, belongs to the buttercup family, has a bitter taste, and possesses cooling and drying tendencies. The root of the plant is used for medicinal purposes. According to Tilgner, goldenseal is an alterative, or an herb that helps cleanse, revitalize and nourish your lymphatic fluids and cleanse your blood, which may be helpful in combating sarcoidosis-related symptoms, especially lymphatic system problems. If you are pregnant, cautions Tilgner, you should avoid taking this herb, due to its ability to stimulate your uterus. Consult your doctor for medical clearance before taking goldenseal supplements.